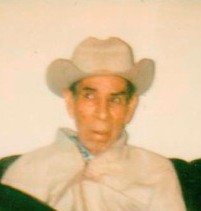 Candido Luna, Sr. was born October 12, 1907 in Terlingua, the son of Alejandro Luna and Antonia Lujan Luna (see http://www.lifebeforetheruins.com/alejandro-luna.html ) He was baptized there by Father Brocardus May 4, 1908. His godparents were Dolores Duran and Guadalupe Luna. Candido married Manuela Luitt in Alpine November 4, 1935. They may have been married earlier in a civil ceremony. Manuela was born in Fort Stockton June 5, 1919 and was baptized there July 6, 1919. She was the daughter of Bernardo Martinez Luitt and Facunda Gallegos (see http://www.lifebeforetheruins.com/gabriel-gallegos.html). In her baptism record her name was shown as Manuela Martinez. Her godparents were Valente Prado and Maximiana Armendariz. Candido died June 15, 1978 and is buried in the Seminole Cemetery. Manuela was living in Seminole in April 2011. Candido and Manuela had six children: 1. Candido Jr., 2. Bernardo, 3. and 4 Twins Jorge and Santos, 5. Jose Ariel, 6. Anselmo. In addition to her own children, Manuela raised Benjamin Rivera, son of Rebeca Luna and Pablo Rivera, and Guadalupe Chavez, daughter of Carlos Chavez, Jr. and Luz Mendez. 1. Son Candido Luna, Jr. was born in Alpine September 15, 1935. Candido Jr. visiting with friends Margarita (left) and Tina (right) Franco at the Franco home in Alpine. The Franco dog Skipper is in the foreground. Photo provided by Louisa Franco Madrid (sister of Margarita and Tina). aa. Son Joe Anthony Gallegos was born August 31, 2008.
bb. Daughter Alissa Neveh Gallegos was born April 9, 2010.
a. Son Omar Avila, Jr. was born July 3, 1990.
b. Son Bernardo Luis Avila was born July 12, 1991.
c. Son Servando Avila was born November 28, 1995.
d. Daughter Isabella Jasmin Avila was born December 24, 1996.
a. Son Lorenzo Loya, Jr. was born March 3, 1990.
aa. Son Julio Ceasar Vega was born May 25, 2009.
a. Son Tomas Velasques was born January 25, 1994.
b. Daughter Marie Velasques was born May 13, 1996.
a. Daughter Marissa Rios was born January 28, 2007.
a. Son Darian Dominguez was born January 2, 2000.
a. Daughter Briygeth Yamille Dominguez was born January 8, 2004.
b. Son Brian Salvador Dominguez was born July 20, 2007. B. Daughter Imelda Luna was born February 2, 1956 in Seminole. She died in Seminole July 21, 2006 and is buried in the Gaines County Cemetery in Seminole. a. Son Carlos Villalva III was born January 24, 1991.
b. Daughter Savanna Villalva was born August 5, 1993.
c. Son Joe Villalva was born April 22, 1995.
d. Daughter Amanda Villalva was born November 22, 1999.
a. Son Brandon Grado was born April 7, 1995. 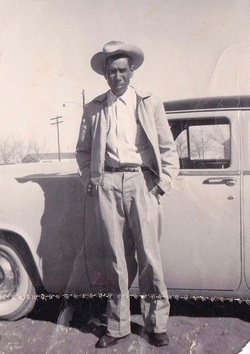 Candido Luna, Jr. later married Oralia Nanez, born March 20, 1932 in San Marcos, Texas. She was the daughter of Patricio Nanez and Julia Barron. 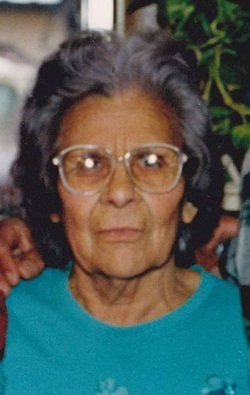 She died in Seminole May 28, 2009 and is buried beside Candido, Jr. in the Gaines County Cemetery in Seminole. A. 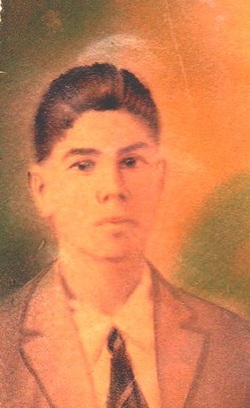 Son Adolfo Luna had one child with Maria Dolores Hermosillo. (1) Son Alexander Luna was born in Medical Arts Hospital, LaMesa, Texas September 2, 1985. He lived in Seminole until 1996 when he moved to Carlsbad, New Mexico, where he was living in 2011. He graduated from Carlsbad High School May 24, 2003. In 2007 he obtained his Emergency Medical Technician License and was working for the Carlsbad Fire Department. In 2011 he was enrolled in Eastern New Mexico University working on a degree in Emergency Medicine with the goal of obtaining a Paramedic License. Adolfo Luna later married Ortanza Espinoza and they had two children. B. Daughter Nelda Luna married Fernando Espinoza. She died December 18, 2005 and is buried in Gaines County Cemetery. Nelda and Fernando had three children, all living in Seminole in April 2011. (1) Son Fernando Espinoza was born in Andrews County April 13, 1979. (2) Son Chris Espinoza was born in Gaines County June 28, 1982..
(3) Daughter Linda Espinoza was born in Andrews County June 11, 1985. (1) Daughter Candida Ann “Candi” Asebedo was born January 14, 1978 in Andrews County. She was living in Midland in April 2011. (1) Son Rene Guerrero III was born in Andrews County March 6, 1986.
a. Daughter Alyssa Baros was born March 14, 2003.
a. Daughter Victoria Baros was born February 12, 2009.
b. Daughter Yvette Baros was born June 23, 2010.
a. Daughter Eris Oralia Guerrero was born February 22, 2011. 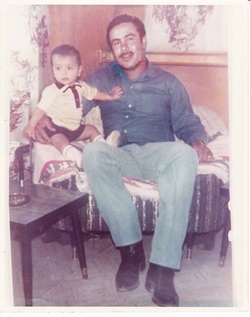 (2) Son Orlando Guerrero was born March 26, 1991 in Andrews. (3) Son Rey Guerrero was born June 7, 1995.
c. Son Lee Roy Luna. 2. 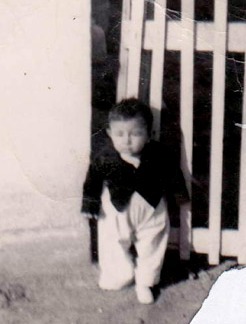 Son Bernardo Luna was born in Alpine in December 1939(a). In September 1941 he was taken to Shannon Hospital in San Angelo for treatment of a middle ear infection, but he died there October 3, 1941. He was buried in Miles, Texas, about 20 miles northeast of San Angelo. 3. Son Jorge Luna, twin of Santos, was born April 23, 1943 in Alpine. He was baptized in Alpine by Father Manusio Juaniz May 1, 1943. His godparents were Manuel Mancha and Rosa Luna. Jorge died of Colitis in Alpine June 28, 1944 and is buried in Holy Angels Cemetery. 4. Son Santos Luna, twin of Jorge, was born April 23, 1943 in Alpine. He was baptized in Alpine by Father Manusio Juaniz May 1, 1943. His godparents were Manuel Mancha and Rosa Luna. He died of bronchial pneumonia and measles in Alpine June 30, 1944 and is buried in Holy Angels Cemetery. 5. 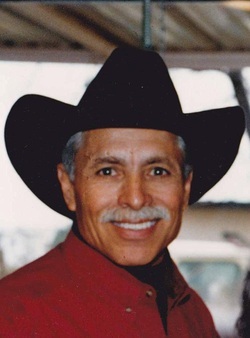 Son Jose Ariel Luna was born in Alpine May 5, 1945. He lived in Alpine until 1954 when the family moved to Seminole. At about the time of the move, he dropped the first name Jose. Ariel lived in Seminole until 1994, when he moved to Big Spring. Ariel worked for Forrest Lumber Co. from 1967 to 1978. He then went to work for Unichem Chemical Company and continued with that company until his retirement April 17, 2010. He was living in Big Spring in April 2011. On April 5, 1964 he married Irene V. Trevinio, who was born July 15, 1945 in San Brito, Texas. She died in Seminole January 31, 2010.
a. Son Shaun Adrian Bess was born January 3, 2009 in Llano, Texas. b. Son Austin Gage Guidry was born December 31, 2010 in Llano. a. Daughter Lacy Rylee Almager was born in Llano, Texas December 1, 2005.
b. Daughter Jossalyn Marie Thomason was born July 16, 2008 in Llano. She died September 25, 2008 in Marble Falls and is buried there. d. Daughter Adelyda Aleen Thomason was born June 21, 2011 in Round Rock. Texas. (1) Son Mark Anthony Luna. (1) Son Noah Ryan Luna was born April 6, 2005. Ariel Luna Jr. and uncle Candido Luna Jr.
(1) Daughter Baylee Madison Lopez was born in Lubbock July 31, 1997. (2) Son Reagan Bryce Lopez was born October 29, 2001 in Lubbock. (1) Daughter Alexis Luna was born June 26, 1995 in Lubbock. (2) Son Madison Luna was born December 1, 2005 in Lubbock. (2) Daughter Briana Ramirez was born in Denver City December 12, 1994. (3) Daughter M’kayla Ramon was born in Odessa August 23, 1998. (1) Daughter Emmy Blowe was born in Midland January 30, 2003. (1) Daughter Jocelyn Rae Martinez was born August 11, 2005. (2) Daughter Angela Marie Martinez was born November 1, 2006. (1) Daughter Nariah Destiny Rosales was born January 11, 2001 in Andrews. (2) Daughter Kaysia Dominque Rosales was born January 3, 2003 in Andrews. (3) Son Dayven Maddex Rosales was born February 12, 2006 in Seminole. (1) Daughter Harley Jo Espino was born in Andrews January 12, 2010. C. Son Anselmo Luis Luna, Jr. was born May 3, 1985 in Andrews.